I sometimes think that one moment of fantasy can transform all our realities. In that one moment when we allow our thoughts to travel on transparent wings to unknown destinations, we surmount time, space, and gravity, for none of them present barriers that prevent our thoughts travelling where they will. Just a week ago my grandson sent me pictures via Facebook; then my granddaughter sent a letter with a complete description of all they, and their friends had been doing – well almost all, I didn’t really expect the minutiae from six young people on vacation in the city of the Medicis and Michelangelo After all, to be young, in love, and in Florence, one doesn’t need to elaborate. Enough to say, I remember being in that same city many years ago, and being captivated by its beauty, as much as I was captivated by the language and the people. The magic of Italy has never gone away, so presented with the opportunity to fantasise, my mind took wing, and as I was typing an email in reply to my granddaughter, it was not difficult to imagine myself back in that most beautiful of all cities. What a joy to relive those moments again. After all, there’s no law saying a grandmother can’t relive her fantasies and dreams through her memories. It’s one of the consolations of increasing years. Creaky joints may have become tiresome in protesting their increasing reluctance to walk too far, but nothing can stop my imagination and my memories weaving the stuff of dreams. 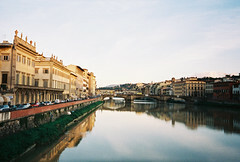 Can anything surpass the first glimpse of those terracotta rooftops, and the sheer magic of the Ponte Vecchio spanning the Arno? The treasures within the museums, as well as those on permanent display in the city’s environs, are as wonderful as any in the world, but then I’m biased. 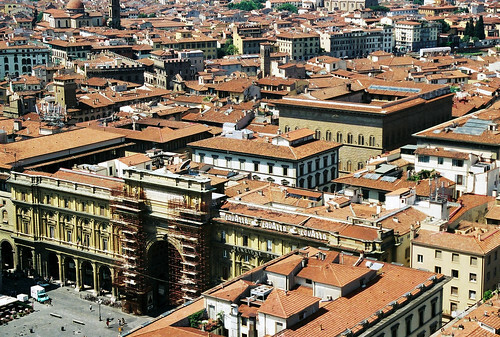 Once seen, Florence can never be forgotten. 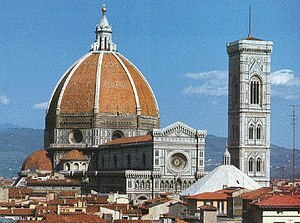 Florence and all that it holds have special memories for me too. Isn’t it wonderful how the internet can connect us to these memories? You are so right. I bless my desktops and all the happy moments they’ve brought me over the years with so many strangers who have become virtual friends. Thanks for dropping by. I love reading what you write Maureen. You have a true skill with words. The internet is not all good but I love the fact that it enables me to connect. Love your thoughts and journey’s Maureen. You too, and thank you for passing by and taking the time to comment. There is no end to what might happen; only the extent of your imagination. Enjoy your travels. Madam, we can go to any limit with our fertile imagination. On and on we go with the wings of our imagination, just no limitation, no impediment on the way, it is our freedom of imagination!